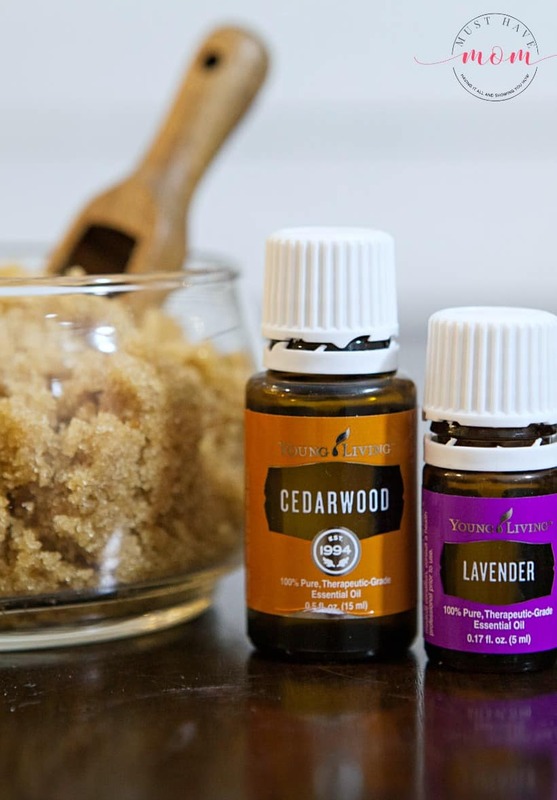 Bring the spa into your home with this relaxing and refreshing cedarwood and lavender brown sugar scrub recipe. The brown sugar gently exfoliates while the cedarwood essential oil promotes healthy, clear skin and the lavender relaxes you. It’s truly a spa experience at home and doubles as a great gift idea! What are the benefits of a brown sugar scrub? 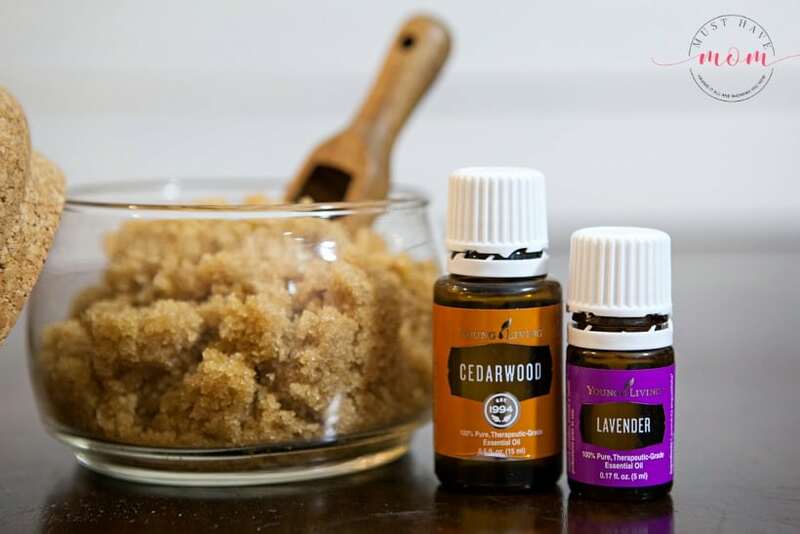 This cedarwood and lavender brown sugar scrub is a refreshing spa experience at home and it also delivers some big benefits to your skin! Brown sugar is a great natural exfoliator for your skin. It’s better than salt in that it’s finer and more gentle. It will exfoliate without damaging the skin’s surface. It can even be used on your face or on sensitive skin. It will gently exfoliate away the dead skin cells and leave skin fresh and healthy. Brown sugar also contains glycolic acid which helps naturally fight bacteria on the skin’s surface. It also helps keep skin looking young and healthy. 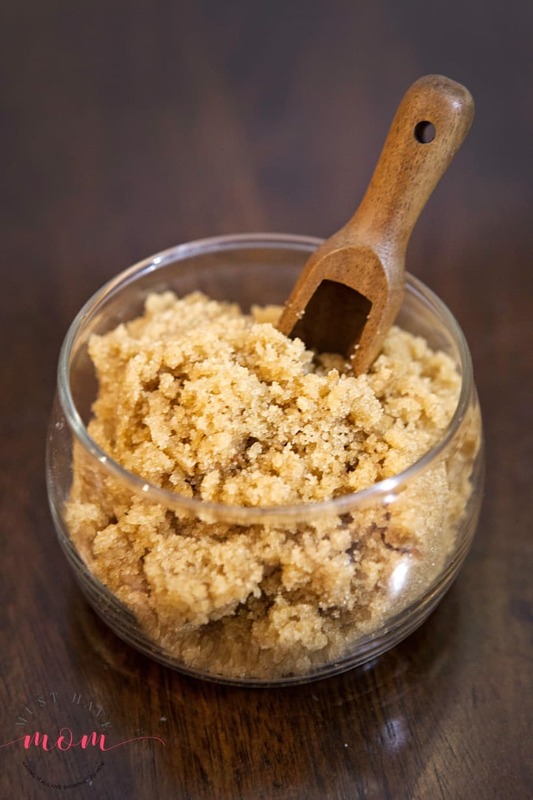 The brown sugar helps to break down skin cells which supports cell turnover which leads to healthier looking skin. It can even help improve sun damage and improve aging skin. 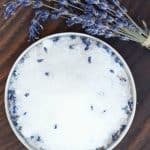 The benefits of a sugar scrub are numerous and the best part is how easy and affordable it is to make your own homemade sugar scrub recipe. You’ll need a few simple ingredients and in a matter of minutes, you’ll have your own luxurious sugar scrub! 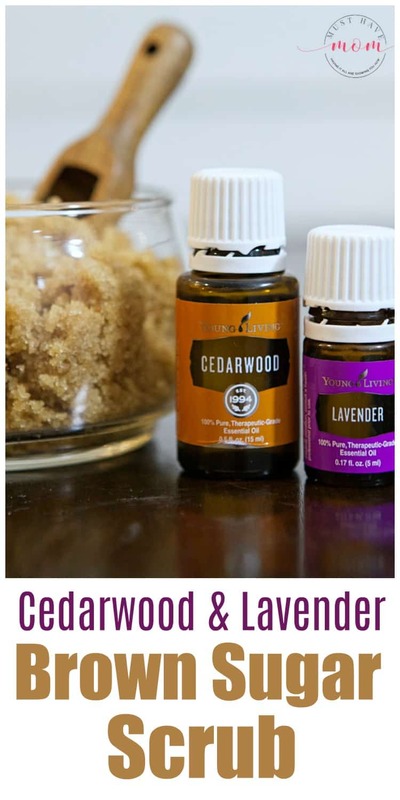 I combine cedarwood and lavender essential oils from Young Living in this sugar scrub recipe. 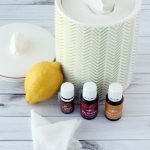 Both essential oils carry many benefits and I specifically use Young Living oils because I trust that they are pure and do not contain any harmful additives that many other oils on the market contain. You can buy Young Living essential oils through my link and read why I believe in this company so much here. Coconut oil is loaded with numerous health benefits including being really beneficial to your skin. It is antimicrobial and moisturizes the skin. There are 20 ways to use coconut oil for skin that go beyond this amazing sugar scrub. Now that you know the reasons behind each ingredient, we can talk about how easy it is to make this homemade sugar scrub. Begin by pouring the brown sugar into a medium-size bowl. Melt your coconut oil until it reaches a liquid state but do not heat it. You can do this on the stovetop or in the microwave in short bursts. Slowly add to sugar and mix until well blended. 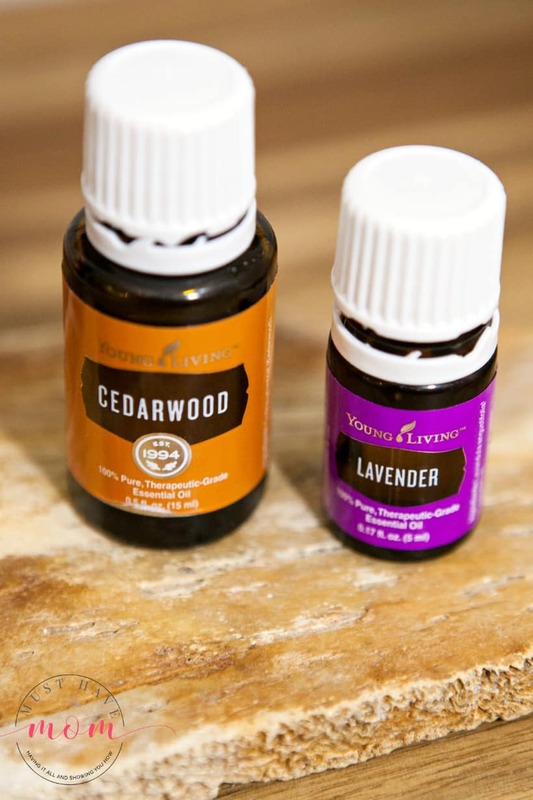 Add Cedarwood and lavender essential oil. Mix until thoroughly blended. Store in airtight glass or metal container. 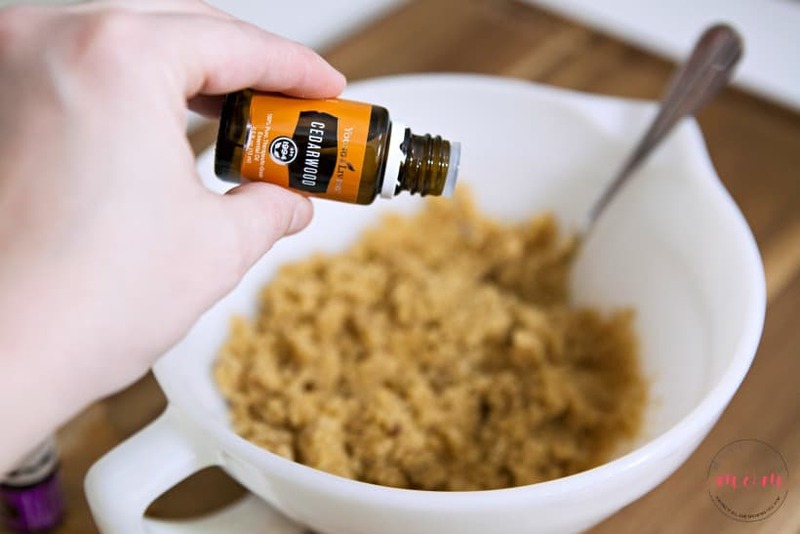 To use this homemade sugar scrub, grab a dollop of the brown sugar scrub in your palm while in the shower or bath, and gently exfoliate your skin with it. Rinse away and repeat, focusing on rough areas like heels, knees and elbows. These make beautiful gifts, especially when you put them in pretty glass jars with craft labels and twine. Treat yourself and your friends to a relaxing spa experience at home. Your skin will thank you for it! 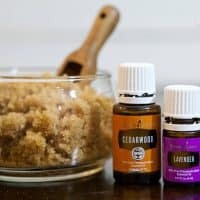 Bring the spa to your home with this easy and affordable cedarwood and lavender brown sugar scrub. 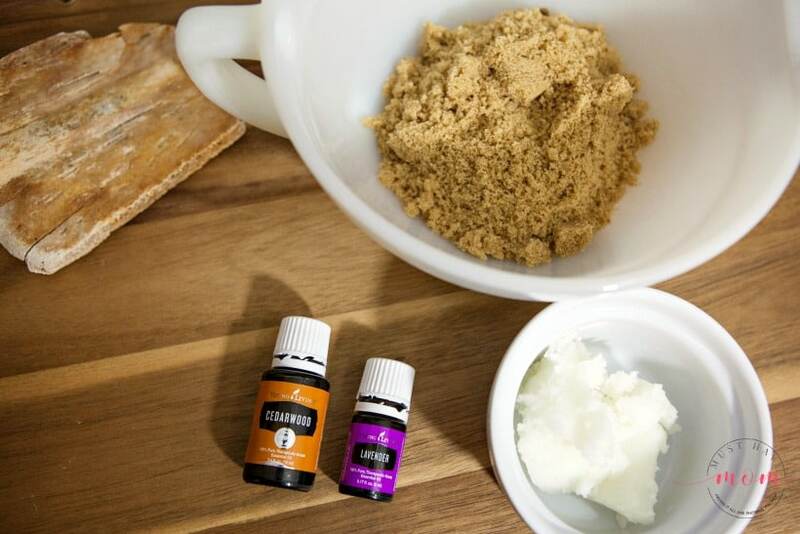 Brown sugar gently exfoliates while the cedarwood promotes healthy, clear skin and the lavender relaxes. Great for a gift or to treat yourself to a spa experience at home. Pour sugar into a medium sized bowl. In a separate bowl, measure out your coconut oil. Place in microwave for one minute, stirring every 15 seconds until melted but not hot. Slowly add to sugar and mix until well blended. Add Cedarwood and lavender essential oil. Mix until thoroughly blended. Store in air tight glass or metal container. To use: In the shower or bath grab a dollop of sugar scrub and gently exfoliate your skin. Rinse away and repeat, exfoliating as much of your body as you'd like. Concentrate on rough spots such as heels, elbows and knees. This recipe can be adapted and changed as you wish. 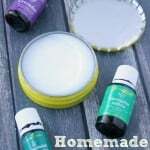 Mix it up by using different combinations of essential oils. This sounds like a great scrub. I love Lavender. I bet this smells good. I would love to try this scrub recipe.